One of the great things about being an undecided voter is that politicians are desperate for my vote. And believe me, I make them work for it. You see, I don’t belong to a political party. I’m more complicated than that. I like to dig a little deeper than most voters, and I take my decision about who to vote for very seriously. So when my dry cleaner told me there was going to be a debate between America’s vice-presidents, I got excited—I'm always eager to learn more about the people running for the White House, but especially during an election year since that’s usually when I vote for them. The debate did not disappoint. I’m glad I cancelled my kite-making workshop to watch it. It featured many interesting questions and answers, and gave me a lot to think about as I prepare to cast my ballot. 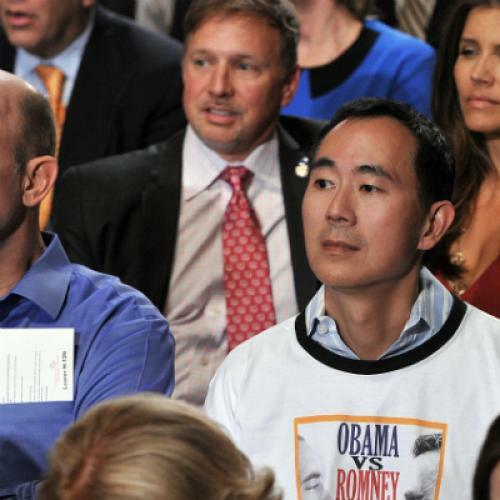 - The candidates’ names were Joe Biden and Paul Ryan. I know this because I wrote them down on my pad. - The moderator (whose name I didn’t catch) was very professional, a credit to all people of gender. I must remember to start taking them more seriously. - On foreign policy, I was impressed that both candidates knew about the attack on our embassy. This is an important issue for me, as I consider myself a bit of an expert on Liberia. - Joe Biden had a lot of energy. At first I thought it was charming when he’d interrupt Paul Ryan to say, “You must be smoking crack to think 15 percent deficits are possible with 7.1 percent unemployment rebates on middle-class deductions since 1982” (or whatever). Then I found his outbursts condescending. But eventually I grew to love them again. After a few seconds, however, they annoyed me. Eventually I reached my conclusion about how Biden’s behavior would influence my vote, but I forgot to write it down, so I can’t remember what my conclusion was. - Mitt Romney is a good man with a large heart. I know this because Paul Ryan told a story about a family that got hit by a car, and how Romney paid for them to go for college for free. My son Scott graduates high school next year; if he asks me to pay for college I will throw him in front of a car. - Joe Biden said 47 percent of Americans are his mom and dad. Catholic families are even bigger than I thought! - I’m no fan of loopholes. I think loopholes should be closed, and I was reassured when Ryan said his boss (Romney) would solve the budget crisis by closing all the loopholes. Biden said something about one of the loopholes being the mortgage interest credit deduction loophole (?). In the spirit of bipartisanship and undecidedness, I vote we keep that loophole open and solve the budget crisis without it. Let’s try cutting taxes instead. - I was touched when Biden and Ryan were asked how their Catholic faith informs their views on abortion. Abortion is a very important issue for me, and I always ask where candidates stand on it, because it helps me determine if they’ve heard of abortion. - In the end, I have to give the debate to Paul Ryan. He seemed focused, competent, with good solutions for the problems we face in this country. I thank both campaigns for their appeals for my vote, but they can stop now: I am casting my vote for Obama/Ryan 2012.